I see that, too. And also a bit of Jared Leto, perhaps? stud! love the layering and leather jacket! I need to meet him. I need him to be my boyfriend. Yep, I had similar thoughts. He’s adorable. I am not American and I thought the same thing. Raskolnikov! Excactly Sonya! But also very french. He has a great style ! Ahhhhh that leather jacket..BE MINE! I fell in love with him! 21st century James Dean. Love everything about this picture. It makes me want to go be badass in Paris. 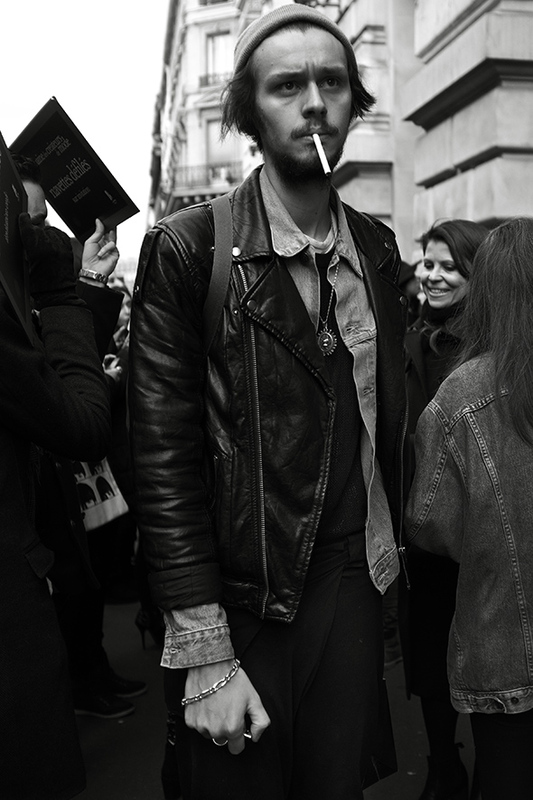 What a fine piece of grunge on the streets of Paris. The whole thought flows through the face there. The comfort comes with the billowing smoke. So natural. Beautiful indeed. I wonder how did the photographer took that photo – was the subject prepared or not – if not the natural photography gets a prize.. Reminds me of ’90s Johnny Depp. Deep and brooding. Love it! Ohhhh I am in love! There is certainly something about him isn’t there? This is in my opinion one of your finest shots yet. The man’s definitely got style! Super talent photography on display! Didn’t even notice what he was wearing as much as all that’s going on in the shot, and yet also so silent in that we zone in on this dude. Awesome.